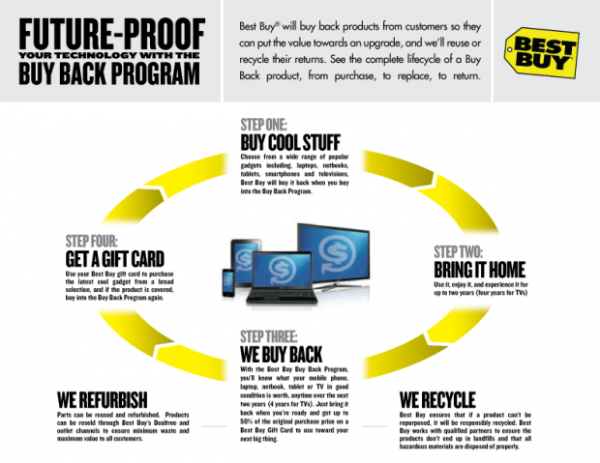 Best Buy’s Buy Back Program, Why You Should Consider it. 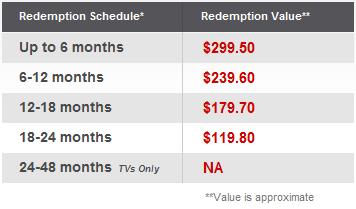 Most of you know by now that Verizon’s upgrade policy has changed and that their “New Every 2” and 1-year upgrade programs have come to an end leaving you wondering how on Earth you’ll be able to keep a phone on 2-year contract for an entire 20 months. Things in mobile are changing so fast that it’s hard to imagine that you could be without an option to upgrade for almost 2 years, which in this field, is like 5 years. That’s where Best Buy’s Buy Back program comes in. Up until this point, we’ve sat back to see how this new scheme would work, and thanks to our friends at BB, we have all the details you need. How much does it cost? Let’s use the HTC Thunderbolt as an example since it will likely be the first 4G device from Verizon to hit store shelves. A potential situation would go something like this, should you walk into a Best Buy and decide today that you need a new phone. As you enter, you’ll be greeted with a ton of phone options, one of them being the DROID Incredible for $1 which you decide to buy while signing a 2-year contract to get that insanely low price. How does it work? You are about to spend $1 on an Incredible, plus the $60 for the Buy Back program and this is why. Once you make that purchase, you will now have 2 years to sell that Incredible back to Best Buy should some other device come out that excites you. What we should point out though, is the fact that even though you paid $1 for the phone, Best Buy treats it as if you paid $599 aka full retail price for it. So this is where the good stuff happens. How much can you sell it back for? Since Best Buy looks at your $1 purchase as being worth $599, you can receive up to half of that in return on a gift card within the first 6 months. What does that mean exactly? That means, that if the Thunderbolt comes out in March (which is within 6 months of you purchasing the Incredible), you can return that $1 Incredible and receive a $299 gift card to put towards the purchase of the first 4G LTE phone on the planet even though you are locked into a 2-year contract. Now, in order to get your Thunderbolt, you’ll have to use the $299 gift card and purchase your new phone at full retail which could cost you another $300. But isn’t that better than paying the full $599 should you be locked into a contract over at Verizon? The real cost? We should point out that since you’ve actually invested $61 (phone and Buy Back program), when you get your $299 gift card, that in reality it’s only worth about $238. Not to try to confuse anyone, we just want to make sure you don’t forget the cost of the program. Why not do it? If Verizon is going to remove all of their early upgrade incentives, then options like this one from Best Buy seem like a no-brainer. This is obviously for the tech-obsessed who can’t hang on to the same phone for more than 6 months, but for those in that category, this will save you at least a few hundred dollars.